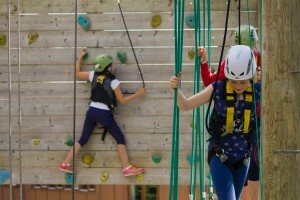 Tollymore National Outdoor Centre’s High Ropes Course consists of a range of personal and team challenge tasks, suitable for those aged 10 years and over. Ropes courses have been used for many years in outdoor centres, providing memorable, enjoyable experiences in a safe environment. Increasing awareness of own skills and abilities to name a few. With a challenging high ropes, balance and coordination skills course and a less strenuous but equally enjoyable low ropes course, there is a choice of activities for all abilities.